Rooted in tradicion mexicana and infused with Texas food culture, tacos are some of Texans' all-time favorite foods. In The Tacos of Texas, the taco journalists Mando Rayo and Jarod Neece take us on a muy sabroso taco tour around the state as they discover the traditions, recipes, stories, and personalities behind puffy tacos in San Antonio, trompo tacos in Dallas, breakfast tacos in Austin, carnitas tacos in El Paso, fish tacos in Corpus Christi, barbacoa in the Rio Grande Valley, and much more. Starting with the basics--tortillas, fillings, and salsas--and how to make, order, and eat tacos, the authors highlight ten taco cities/regions of Texas. For each place, they describe what makes the tacos distinctive, name their top five places to eat, and listen to the locals tell their taco stories. They hear from restaurant owners, taqueros, abuelitas, chefs, and patrons--both well-known and everyday folks--who talk about their local taco history and culture while sharing authentic recipes and recommendations for the best taco purveyors. 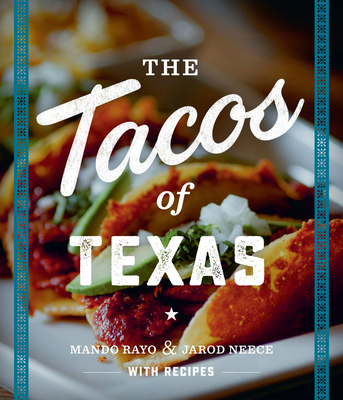 Whether you can't imagine a day without tacos or you're just learning your way around the trailers, trucks, and taqueros that make tacos happen, The Tacos of Texas is the indispensable guidebook, cookbook, and testimonio.